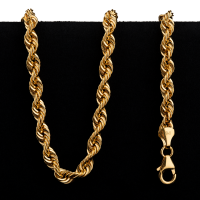 The GoldSilver.com Modern Ancients series pays homage to the invention of money, whereby gold and silver were separated and made into units of equal weight. 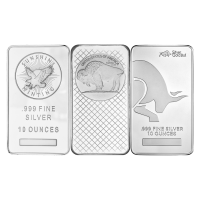 The first silver round in the series is based on the design originally used in by King Croesus around 560 B.C. Each coin in this series will bring an ancient coin back to life with stunning artwork. The obverse features a roaring Lydian lion, paw lifted as a threat while it gazes back upon a bull. The lion attacking the bull motif on the original coin type has been variously theorized as symbolizing the sun and moon, spring and winter (the fall of the constellation Taurus corresponded to the date of the spring sowing), or strength and fertility. The bull is not waiting to be attacked, it has it's front hoof raised and is looking directly at the lion. The word "Resolve" surrounds the scene and perfectly describes the stance of both animals. The reverse features the Lydian Bull and Lion, a fitting homage to mankind's first true money coined in Lydia in approximately 560 BC. The bull and lion surround a crest that is divided into four quadrants, each with an image and the crest is capped by a sun, symbolizing enlightenment. Below the crest is the symbol for wealth cycles, which closes resembles the symbol for infinity, and in the scroll work is the formula revealed in the video series "Hidden Secrets of Money" by Mike Maloney. The reverse also features the inscription "Free Markets & Free People" and the words "10 Troy Ounce 999 AG GoldSilver.com"
These 10 oz proof like rounds have a mirror finish, and are sure to be a favourite due to it's magnificent design. 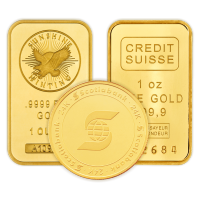 This round was minted for only 90 days and will not be produced again. This proof comes in a red and black slip case with the round held in an acrylic holder. 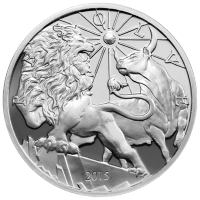 Obverse A lion with it's front paw raised looking back at a bull with the sun shining overhead and the words "Resolve 2015"
Reverse The Lydian Bull and Lion supporting a crest divided into quadrants capped by a blazing sun and the words "Free Markets & Free People 10 Troy Oz .999 AG GoldSilver.com"
A lion with it's front paw raised looking back at a bull with the sun shining overhead and the words "Resolve 2015"
The Lydian Bull and Lion supporting a crest divided into quadrants capped by a blazing sun and the words "Free Markets & Free People 10 Troy Oz .999 AG GoldSilver.com"
10 oz 2015 Modern Ancients Lion and Bull Silver Proof Round The GoldSilver.com Modern Ancients series pays homage to the invention of money, whereby gold and silver were separated and made into units of equal weight. 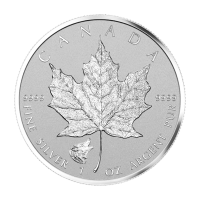 The first silver round in the series is based on the design originally used in by King Croesus around 560 B.C. Each coin in this series will bring an ancient coin back to life with stunning artwork. The obverse features a roaring Lydian lion, paw lifted as a threat while it gazes back upon a bull. The lion attacking the bull motif on the original coin type has been variously theorized as symbolizing the sun and moon, spring and winter (the fall of the constellation Taurus corresponded to the date of the spring sowing), or strength and fertility. The bull is not waiting to be attacked, it has it's front hoof raised and is looking directly at the lion. The word "Resolve" surrounds the scene and perfectly describes the stance of both animals. 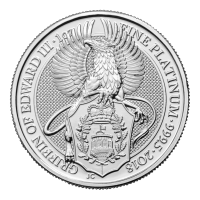 The reverse features the Lydian Bull and Lion, a fitting homage to mankind's first true money coined in Lydia in approximately 560 BC. The bull and lion surround a crest that is divided into four quadrants, each with an image and the crest is capped by a sun, symbolizing enlightenment. Below the crest is the symbol for wealth cycles, which closes resembles the symbol for infinity, and in the scroll work is the formula revealed in the video series "Hidden Secrets of Money" by Mike Maloney. 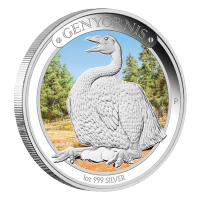 The reverse also features the inscription "Free Markets & Free People" and the words "10 Troy Ounce 999 AG GoldSilver.com" These 10 oz proof like rounds have a mirror finish, and are sure to be a favourite due to it's magnificent design. 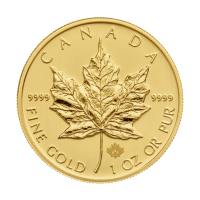 This round was minted for only 90 days and will not be produced again.